Felix the Cat is a cartoon character created in the silent film era. His black body, white eyes, and giant grin, coupled with the surrealism of the situations in which his cartoons place him, combine to make Felix one of the most recognized cartoon characters in film history. Felix was the first character from animation to attain a level of popularity sufficient to draw movie audiences. Template:TOC left Felix's origins remain disputed. Australian cartoonist/film entrepreneur Pat Sullivan, owner of the Felix character, claimed during his lifetime to be its creator. American animator Otto Messmer, Sullivan's lead animator, has more commonly been assigned credit by Americans in recent decades. Some historians argue that Messmer ghosted for Sullivan although Messmer's creation claim has not been proven. 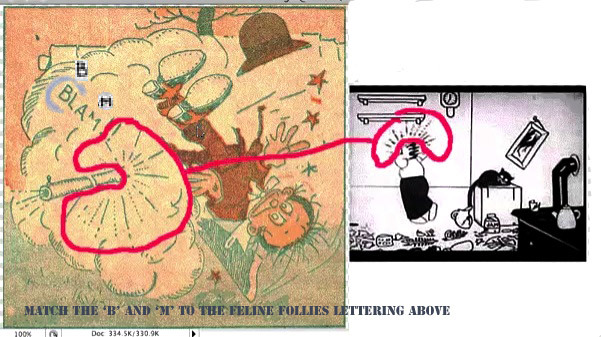 The art and lettering in Feline Follies have been identified as Pat Sullivan's work, whereas Messmer's claim completely excluded Sullivan from the animation. What is certain is that Felix emerged from Sullivan's studio, and cartoons featuring the character enjoyed success and popularity in the 1920s. In the early 1920s Felix enjoyed enormous popularity in popular culture. He got his own comic strip (drawn by Messmer) beginning in 1923, and his image soon adorned all sorts of merchandise such as ceramics, toys and postcards. Several manufacturers made stuffed Felix toys. Jazz bands such as Paul Whiteman's played songs about him (1923's "Felix Kept On Walking" and others). Felix cartoons began airing on American TV in 1953. Meanwhile, Joe Oriolo, who was now directing the Felix comic strips, introduced a redesigned, "long-legged" Felix in a new animated series for TV. Oriolo also added new characters, and gave Felix a "Magic Bag of Tricks", which could assume an infinite variety of shapes at Felix's behest. The cat has since starred in other television programs and in two feature films. Felix is still featured on a wide variety of merchandise from clothing to toys. Oriolo's son, Don Oriolo, now controls creative work on Felix movies. On 9 November 1919, Master Tom, a prototype of Felix, debuted in a Paramount Pictures short entitled Feline Follies. Produced by the New York City-based animation studio owned by Pat Sullivan, the cartoon was directed by cartoonist and animator Otto Messmer. It was a success, and the Sullivan studio quickly set to work on producing another film featuring Master Tom, the Felix the Cat prototype in The Musical Mews (released 16 November 1919). It too proved to be successful with audiences. Otto Messmer gave two different versions of how Felix got his name, the one on his official site ”Rejoining Sullivan with a great idea for a new character named Felix the Cat, and the second that ”Mr. (John) King of Paramount Magazine suggested the name "Felix", after the Latin words felis (cat) and felix (lucky), which was used for the third film, The Adventures of Felix (released on 14 December 1919). Pat Sullivan said he named Felix after Australia Felix from Australian history and literature. In 1924, animator Bill Nolan redesigned the fledgling feline, making him both rounder and cuter. Felix's new looks, coupled with Messmer's character animation, brought Felix to fame. The question of who created Felix remains a matter of dispute. Sullivan stated in numerous newspaper interviews that he created Felix and did the key drawings for the character. On a visit to Australia in 1925, Sullivan told The Argus newspaper that "The idea was given to me by the sight of a cat which my wife brought to the studio one day." On other occasions, he claimed that Felix had been inspired by Rudyard Kipling's "The Cat that Walked by Himself" or by his wife's love for strays. Members of the Australian Cartoonist Association have demonstrated that lettering used in Feline Follies matches Sullivan's handwriting. Pat Sullivan also lettered within his drawings which was a major contradiction to Messmer's claims. Sullivan's claim is also supported by his 18 March 1917, release of a cartoon short entitled The Tail of Thomas Kat, more than two years prior to Feline Follies. Both an Australian ABC-TV documentary screened in 2004 and the curators of an exhibition at the State Library of New South Wales, in 2005, suggested that Thomas Kat was a prototype or precursor of Felix. However, few details of Thomas have survived. His fur color has not been definitively established, and the surviving copyright synopsis for the short suggests significant differences between Thomas and the later Felix. For example, whereas the later Felix magically transforms his tail into tools and other objects, Thomas is a non-anthropomorphized cat who loses his tail in a fight with a rooster, never to recover it. References to alcoholism and Prohibition were also commonplace in many of the Felix shorts, particularly Felix Finds Out (1924), Whys and Other Whys (1927), Felix Woos Whoopee (1930) to name a few. In Felix Dopes It Out (1924), Felix tries to help his hobo friend who is plagued with a red nose. By the end of the short, the cat finds the cure for the condition: "Keep drinking, and it'll turn blue." By 1923, the character was at the peak of his film career. Felix in Hollywood, a short released during this year, plays upon Felix's popularity, as he becomes acquainted with such fellow celebrities as Douglas Fairbanks, Cecil B. DeMille, Charlie Chaplin, Ben Turpin, and even censor Will H. Hays. His image could be seen on clocks, Christmas ornaments, and as the first giant balloon ever made for Macy's Thanksgiving Day Parade. Felix also became the subject of several popular songs of the day, such as "Felix Kept Walking" by Paul Whiteman. Sullivan made an estimated $100,000 a year from toy licensing alone. With the character's success also emerged a handful of new costars. These included Felix's master Willie Brown, a foil named Skiddoo the Mouse, Felix's nephews Inky, Dinky, and Winky, and his girlfriend Kitty. Felix the Cat sheet music, with music by Pete Wendling and Max Kortlander, featuring lyrics by Alfred Bryan, was published in 1928 by Sam Fox Publishing Company. The cover art of Felix playing a banjo was done by Otto Messmer and was subtitled "Pat Sullivan's Famous Creation in Song." Most of the early Felix cartoons mirrored American attitudes of the "roaring twenties". Ethnic stereotypes appeared in such shorts as Felix Goes Hungry (1924). Recent events such as the Russian Civil War were depicted in shorts like Felix All Puzzled (1924). Flappers were caricatured in Felix Strikes It Rich (1923). He also became involved in union organizing with Felix Revolts (also 1923). In some shorts, Felix even performed a rendition of the Charleston. In 1928, Educational ceased releasing the Felix cartoons and several were reissued by First National Pictures. Copley Pictures distributed them from 1929 to 1930. He saw a brief three-cartoon resurrection in 1936 by the Van Beuren Studios (The Goose That Laid the Golden Egg, Neptune Nonsense and Bold King Cole). Sullivan did most of the marketing for the character in the 1920s. In these Van Beuren Studios shorts, Felix spoke and sang in a high pitched child-like voice provided by Walter Tetley, a popular radio actor in the 1930s and 1940s ("Julius" on the The Phil Harris-Alice Faye Show, and "Leroy" on The Great Gildersleeve, however best known later in the 1960s as the voice of Sherman on the Bullwinkle Show's Mister Peabody segments. With the advent of The Jazz Singer in 1927, Educational Pictures, who distributed the Felix shorts at the time, urged Pat Sullivan to make the leap to "talkie" cartoons, but Sullivan refused. Further disputes led to a break between Educational and Sullivan. Only when Walt Disney's Steamboat Willie made cinematic history as the first talking cartoon with a synchronized soundtrack (My Old Kentucky Home from Max and Dave Fleischer's Ko-Ko Song Car-Tunes preceded Willie, but did not gain the same recognition) did Sullivan see the possibilities of sound. He managed to secure a contract with First National Pictures in 1928. However, for reasons unknown, this did not last, so Sullivan sought out Jacques Kopfstein and Copley Pictures to distribute his new sound Felix cartoons. On 16 October 1929, an advertisement appeared in Film Daily with Felix announcing, Jolson-like, "You ain't heard nothin' yet!" In 1935, Amadee J. Van Beuren of the Van Beuren Studios called Messmer and asked him if he could return Felix to the screen. Van Beuren even stated that Messmer would be provided with a full staff and all of the necessary utilities. However, Messmer declined his offer and instead recommended Burt Gillett, a former Sullivan staffer who was now heading the Van Beuren staff. So, in 1936, Van Beuren obtained approval from Sullivan's brother to license Felix to his studio with the intention of producing new shorts both in color and with sound. With Gillett at the helm, now with a heavy Disney influence, he did away with Felix's established personality and made him just another funny-animal character of the type popular in the day. The new shorts were unsuccessful, and after only three outings Van Beuren discontinued the series. Today, Oriolo's son, Don, continues to market Felix. During the late 1980s, Don teamed up with European animators to work on the character's first feature film, Felix the Cat: The Movie. In the film, Felix visits an alternate reality along with the Professor and Poindexter. New World Pictures planned a 1987 Thanksgiving release for U.S. theaters, which did not happen; ultimately, the movie ended up going direct-to-video in August 1991. In 1995, Felix appeared on television again, in an off-beat series called The Twisted Tales of Felix the Cat. Baby Felix followed in 2000 for the Japanese market, and also the direct-to-video Felix the Cat Saves Christmas. Felix also co-starred with Betty Boop in the "Betty Boop and Felix" comic strip (1984–1987). Oriolo has also brought about a new wave of Felix merchandising, everything from Wendy's Kids Meal toys to a video game for the Nintendo Entertainment System. Since the publication of John Canemaker's Felix: The Twisted Tale of the World's Most Famous Cat in 1991, there has been a renewed interest in the early Sullivan-Messmer shorts. In recent years, the films have seen lots of VHS and DVD exposure, most notably on the Presenting Felix the Cat compilations from Bosko Video, Felix! from Lumivision, Felix the Cat: The Collector's Edition from Delta Entertainment, Before Mickey from Inkwell Images Ink. Messmer Felix comic compilations have also begun to emerge including Nine Lives to Live: A Classic Felix Celebration by David Gerstein and more recently The Comic Adventures of Felix the Cat from Determined Productions. According to Don Oriolo's Felix the Cat blog, as of September 2008 there were plans in development for a new television series. Don's biography page also mentions a 52-episode cartoon series in the works, titled "The Felix the Cat Show". The series will use CG graphics and be produced by the French studio TeamTO, in association with Forecast Pictures. The series will be airing on Cartoon Network in 2011. Felix makes a cameo appearance in Disney and Amblin Entertainment film Who Framed Roger Rabbit in the end of the film at Marvin Acme's factory. He first appears as the picture in hand with R.K. Maroon in Maroon's Office, and later appears as the masks of tragedy and comedy on the keystone of the entrance to Toontown. Sonic the Hedgehog is allegedly based on Felix and Mickey Mouse. In Italy, Felix was called Mio Mao under the Fascism, and was published by Corriere dei Piccoli. The cartoon My Life As a Teenage Robot features a diner called "Mezmer's" (named after Otto Messmer), and the doorway to the restaurant is a giant Felix the Cat head. In an episode of The Simpsons, Dean Scungio quotes from "The Encyclopaedia of Animated Cartoons" on the history of Felix: "A Felix doll became Charles Lindbergh's companion on his famed flight across the Atlantic." Another episode of The Simpsons, in which the origins of the cartoon characters Itchy & Scratchy are explored, parallels some of the disputed history Felix's creation set forth above, and includes a spoof film entitled Manhattan Madness, presented as the first Itchy & Scratchy cartoon, supposedly from 1919, that is similar in style to "Felix in Hollywood" and other early Felix animations. Felix appeared in opening credits of Futurama episodes How Hermes Requisitioned His Groove Back, The Lesser of Two Evils and War Is the H-Word. Felix appeared in the music videos for "Pay for Me" by Whale and "My Favorite Game" by The Cardigans, both by Jonas Åkerlund. Felix appeared in Batman Returns. ↑ "The Cat With the Killer Personality". The New York Times, 31 March 1991. Retrieved 2009-08-21. ↑ Mendoza, N.F., "For fall, a classically restyled puddy tat and Felix the Cat". LA Times, 27 August 1995. Retrieved 2010-08-24. ↑ Solomon, 34, says that the character was "the as yet unnamed Felix". ↑ 6.0 6.1 6.2 6.3 6.4 Solomon 34. ↑ 8.0 8.1 "All Media and legends...A thumbnail dipped in tar". Vixenmagazine.com. Retrieved 14 September 2008; archived from the original on 28 September 2008. ↑ Barrier 29 and Solomon 34. ↑ 11.0 11.1 11.2 Solomon 37. ↑ For example, Solomon, 34, quotes Marcel Brion on these points. ↑ Quoted in Solomon 34. ↑ "The Queers – Interviews". Thequeersrock.com. Retrieved 14 September 2008; archived from the original on 28 September 2008. ↑ Gordon, Ian, "Felix the Cat". St. James Encyclopedia of Pop Culture. Archived from the original on 2012-07-14. ↑ "New on Video". Beacon Journal, 1991-08-23, p. D21. Retrieved 2010-06-14.